My son was Googling my name for fun, because it’s super fun to Google your ma’s name when it pops up all over the place, and he stumbled across a tumbler thingy calling ME out for a pin I pinned on Pinterest forever ago. I have no clue how old this tumblarity is, but I kind of wanted to address it, plus, I’m a little bored – sooo . . .
**For clarifications sake, the portion of this I am referring to is inside the yellow box there on the right, the rest is my response. I’m not familiar with Tumbler or pinning, but even so, that “You may think…” comment does not seem to make a lot of sense in the context. I can see why it annoys you. The comment that got to me was the yellow box on the right side, the rest of it was my response I added to the page. 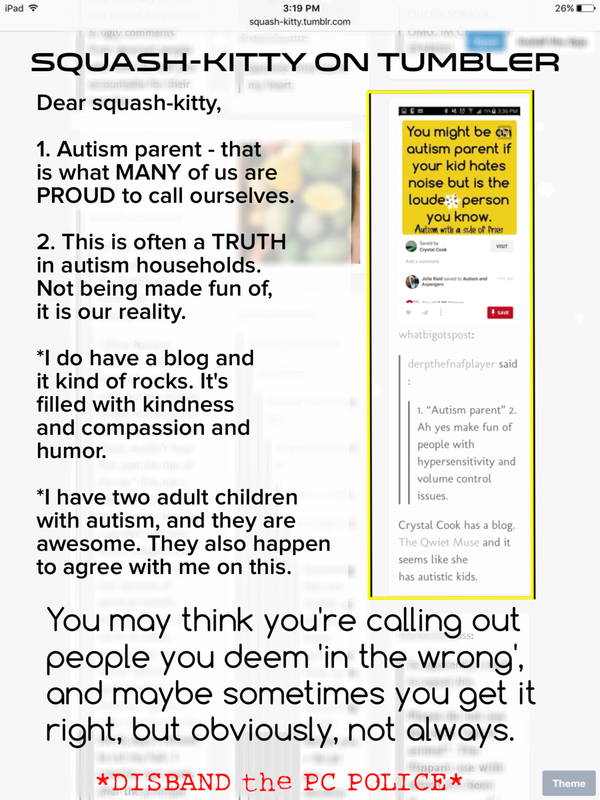 This person was basically saying the meme I shared was in poor taste, truth is, every autism family I know found it humorous, sometimes it’s a choice between laughter and tears for people with special needs kids, Some days it’s a toss up 🙂 The person behind squash-kitty seems to like being judgemental and cruel.